Citizens United is up with new radio ads in Missouri and Indiana in support of Scott Pruitt for EPA Chief! Pruitt is qualified, professional, and ready to get to work for the American people! The election is over, the American people have spoken, and President Trump has chosen qualified professionals for his Cabinet. One of them is Scott Pruitt to lead the EPA. The EPA overregulates, kills jobs, and infringes on our liberty. Scott Pruitt will restore our Constitutional rights by limiting the EPA’s reach. Call Senator Claire McCaskill at 314-367-1364 and tell her to vote to confirm Scott Pruitt. Sponsored by Citizens United. 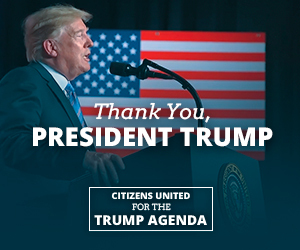 www.CitizensUnited.org. Call Senator Joe Donnelly at 317-226-5555 and tell him to vote to confirm Scott Pruitt. Today Citizens United is releasing 275 pages of State Department emails relating to the Clinton Foundation and other issues that were produced yesterday evening. "Potential Commitment with Government of Russia..."
"I'm abt to ask ariadne getty for her plane..."
"Doug, The following was sent to Secretary Clinton earlier today per your instructions to Andrew." "Big cash problem @ USA Shanghai Expo Pavilion"
Citizens United will continue to release material such as this in the weeks and months to come. “We’re pleased to learn that the FBI has re-opened the criminal investigation into Hillary Clinton’s email mess. While we don’t know what’s been newly uncovered, the facts already in the public domain demonstrate widespread impropriety. Today Citizens United is releasing 612 pages of State Department emails relating to the Clinton Foundation, Dennis Cheng, Doug Band, Haiti, and more. "Do you know if there’s ever been or if there’s been talk of organizing official business delegations for S trips abroad?" "We need to start inviting members soon..."
"Who among our strong Hispanic supporters could we nominate for Amb to the Vatican?" "I am told I am not allowed to leave Doha until our deal is done – and its [sic] not." "Who at the library can tell me which files of hrcs are down there?" This week the State Department produced the last batch of Hillary Clinton's State Department schedules. They cover mostly September 2012 – February 2013, with some random schedules mixed in as well. Today Citizens United is releasing Secretary Clinton's schedule from September 2012. As you will see, the schedules for September 1st through 9th are dated 2010. When asked about this discrepancy, a government lawyer for the State Department said that while the year is wrong, the schedules do reflect what occurred from September 1st through 9th 2012. Citizens United asked if a correct version of the schedule exists and the government's response was that the records speak for themselves and that in FOIA litigation the State Department produces what exists, not correct errors in the requested records. Citizens United asked what the reason was for the error and the government's response was that someone made a mistake entering the year in the schedule four years ago. Citizens United then asked if the State Department was planning on correcting the record and the government again said that in the context of FOIA, the State Department produces records that exist and doesn't clean up errors in the records. Citizens United is concerned about this revelation. We believe at very least the State Department should provide a detailed explanation for this error in Secretary Clinton's schedule during the week leading up to the terrorist attack in Benghazi and correct the record for future requesters. For instance, if a future FOIA request asked for Secretary Clinton's schedule from September 1 – 9, 2012, is it possible the requester would be told no responsive records exist? Today Citizens United is releasing 371 pages of State Department emails relating to the Clinton Foundation, IG investigations, Cheryl Mills, Heather Samuelson, and Patrick Kennedy. "CEO of Pepsi is seeing Putin in next couple days and is looking for a USG briefing..."
"Kate flagged for me an OIG investigation related to [redacted]"
"Attached are pages from the DOJ OIG’s investigation – ostensibly on Operation Fast & Furious..."
"The Department of State has designated…Patrick F. Kennedy to lead the department’s planning for the upcoming transition." "Has HRC or State done or said anything for Yunus?" "...Nursultan Nazarbayev would like to attend CGI"
"Is Thaci still embroiled in organ harvesting issues and is that of consequence?" Today Citizens United is releasing 240 pages of Haiti-related emails between the State Department and Clinton Foundation. "We have accomplished a great deal"
"They treated me extra special"
68 of the total pages are related to the polling USAID commissioned  in Haiti about "Bill Clinton’s image" and other issues that ABC News first reported on yesterday. This polling data was forwarded by Cheryl Mills to Clinton Foundation officials "for WJC." These documents were produced by the State Department as a result of FOIA requests and litigation. Today Citizens United is releasing 198 pages of emails between the State Department and Clinton Foundation on a host of issues. 43 of the pages have to do with the creation of the "Friends of the Clinton Centre" 501c3, its connection to an official State Department trip to Ireland, and a dinner that Secretary Clinton attended that doesn’t appear on her schedule. Other topics include China, Haiti, Iran, Cuba, Mexico, and more. The specter of foreign influence and the appearance of conflicts of interest are critically important issues. We will continue to release emails such as these in the weeks and months to come. •	"Following Secretary Clinton's lecture at Dublin City University…Patrick McDermott will provide a room for us for a brief discussion on the Friends of the Clinton Centre 501…"
•	"And what does Megan Rodham have to do with this"
•	"…asked wjc to help avoid currency legislation b/c it'll mean lots of Chinese businesses collapsing…"
•	"When HRC visited Sarajevo, she proposed a program to train Bosnian entrepreneurs through the Clinton Foundation(?)" •	"Oh come on…you can make this happen…"
•	"Jake - unfortunately, like a bad penny, I'll keep turning up one way or another." •	"Greetings from Jet Li"
•	"I think it should be okay. We have interacted with this guy." Our next email production from the State Department is due on October 10. In light of today’s congressional testimony by FBI Director Comey, Citizen United is releasing over 1,300 pages of email correspondence between Cheryl Mills and Heather Samuelson during their tenures at the State Department. The American people have a right to know about the activities of high level government officials who have since been given immunity deals by the FBI. Mills was State Department Chief of Staff and Samuelson was the White House Liaison at State who went on to serve in the White House Counsel’s office. Mills and Samuelson also sat in during Secretary Clinton’s interview with the FBI as part of her legal team. These emails shed light on the activities of Mills and Samuelson at the State Department, which included appointments, ethics, vetting, etc. Most of these emails are from late 2012 to early 2013 around the Clinton-Kerry transition at State. Our legal team estimates that Citizens United will receive 650 pages of these emails per month until approximately January 2019. Links to the emails below.